This site is a place to celebrate a look, so we rarely mock an outfit, but man are we happy someone was out there rightfully ripping apart fashion no-no’s on and off the red carpet. 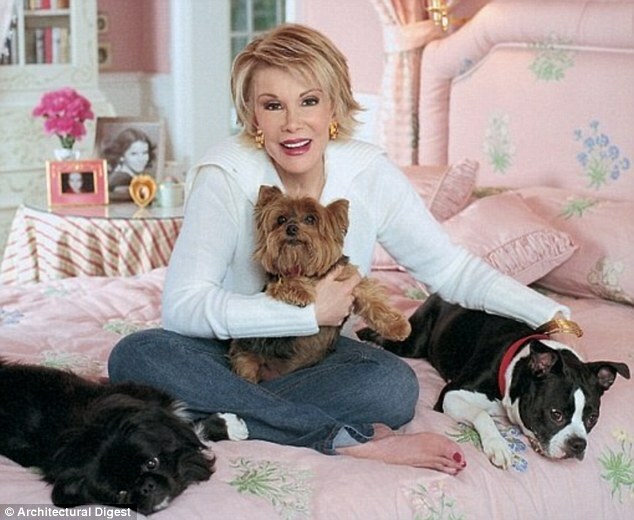 I found this photo of a rarely dressed down Joan Rivers at home with her dogs in her Connecticut home from the February 2003 issue Architectural Digest. Denim and a yorkie? I love you even more. While I’ve never seen her rocking a Canadian Tuxedo, she certainly put her name on plenty of denim through her signature line she sold on QVC. We concur. Rest In Peace. Hoping you’re looking fierce up there with Spike and all your other fabulous dogs and friends. This entry was posted on Thursday, September 4th, 2014 at 2:41 pm	and tagged with Architectural Digest, Denim, e!, Fashion Police, Joan Rivers, QVC, Spike, Yorkie and posted in Uncategorized. You can follow any responses to this entry through the RSS 2.0 feed.